Passenger Side High Pressure Oil HoseThis is the stock high pressure oil feed hose for the passenger side cylinder head. Some trucks will have a different hose, with (2) 90° fittings going to the passenger side head. We feel that this hose fits and flows better without the second 90° bend, if your truck doesn't need the dual 90° hose. 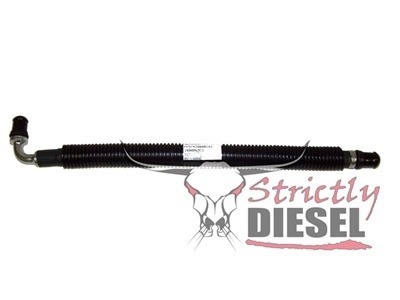 This is the stock high pressure oil feed hose for the passenger side cylinder head. Some trucks will have a different hose, with (2) 90° fittings going to the passenger side head. We feel that this hose fits and flows better without the second 90° bend, if your truck doesn't need the dual 90° hose. If your Truck/Excursion has the rectangular glow plug control module instead of the standard glow plug relay, you will need the dual 90° hose instead of this one. Great quality. Replaced when i bought a new HPOP, wanted to start with new,clean lines. These more than deliverd.